DAVIS, Calif.--(BUSINESS WIRE)--The Zigbee Alliance, an organization of hundreds of companies creating, maintaining, and delivering open, global standards for the Internet of Things (IoT), today announced that Amazon will join its Board of Directors. As IoT growth continues to accelerate, prominent companies in the tech industry are collaborating within the Zigbee Alliance to shape the direction of standards, ecosystems, and devices to offer users easy and enjoyable experiences they’ll want to build upon within their homes and personal spaces. 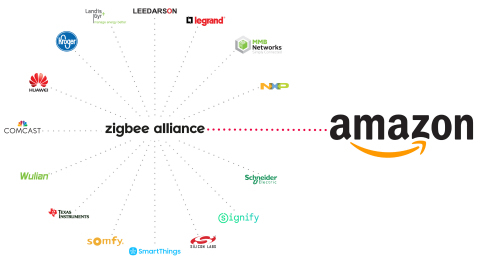 The decision by Amazon to join the Zigbee Alliance at the Board level is a strong message that the industry is focused on simplifying and adding convenience to the growing range of IoT devices available to customers. Moving beyond its infancy, the smart home is taking hold and consumers are embracing IoT products as they continue to become easier to use. Manufacturers and standards organizations are bridging differences and breaking down barriers for the good of the entire industry. With voice services like Amazon Alexa and products such as the Amazon Echo family — which serves as the “brain” or hub of choice in smart homes across the world — consumers can intuitively connect lights, locks, sensors, and more to broaden the conveniences around them. Follow the ZigBee Alliance on Twitter. Follow the ZigBee Alliance on LinkedIn.